What is a Wide Tooth Comb? A wide tooth comb is pretty self-explantarory. 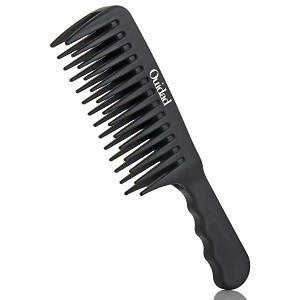 The teeth (the bit that you comb through your hair with) on a standarrd comb tend to be quite close together. However, on a wide tooth comb they are further apart. Who should be using a Wide Tooth Comb? Did you know that your hair is at its weakest whilst it is wet? But, whilst it is still wet is the best time to be combing it. d. Anyone who has tangles either all the time, or occassionally. Why should you be using a Wide Tooth Comb? Using a wide tooth comb is much gentler on your hair, wriggling through your tangles with ease, without excessive pulling that could damage your locks. TIP: If like me, you have hair that tangles regularly, you might want to choose a wide tooth comb that is specifically made for this purpose. Instead of having straight teeth like other combs, detangling ones have pairs of teeth that curl into eachother. This design allows the teeth to get through your knots with ease, and trust me when I say a lot less pain!